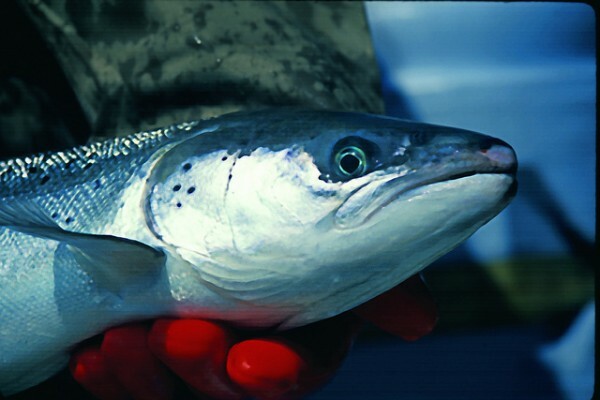 A researcher holds a female Atlantic salmon in this 2009 U.S. Fish and Wildlife Services photo. FREEPORT, Maine — When salmon are grabbed out of the water by large birds of prey, their flesh is pierced and spines often snapped by the talons of the predator. But, if the bird loses its grip on the fish and it falls back into the water, the salmon can often recover and live out its natural life. Such traumatic injuries to a human would be permanently paralyzing, if not fatal. One Freeport company is seeking to unlock the secret of the salmon’s resilience and apply it to humans. Sea Run Holdings LLC has been awarded a U.S. patent for a product derived from salmon blood that dulls pain and stops bleeding, the company announced this week. The firm described its SeaStat-TH as a purified form of the thrombin enzyme found in salmon blood. “Unlike mammalian thrombins, which can exacerbate pain, SeaStat-TH is anti-inflammatory and provides significant and sustained analgesia after a single topical application,” the marine biotechnology company stated in a news release. Sea Run Vice President Charlton Ames said in a statement the product has shown in animal studies to be a stronger painkiller than morphine. “If SeaStat-TH performs as well in clinical trials, it could displace opioids as the preferred treatment for post-surgical pain and traumatic injury,” Ames said. Sea Run Holdings describes itself as a company that discovers and develops medical products — therapeutics and reagents — from farmed salmon. Ed Bilsky, vice president of research and scholarship with the University of New England in Biddeford, is familiar with Sea Run’s work. He told reporters last month that Sea Run’s latest product could be appealing to the U.S. military as an alternative treatment for soldiers suffering traumatic injuries in conflicts overseas. Bilsky said researchers were struck by the improbably fast and thorough recoveries shown by farm salmon that were snatched up by birds of prey and then unintentionally dropped. “In these pens, they noticed that the salmon stopped bleeding almost immediately and they regained function, despite having spinal cord injuries. Humans don’t do that,” Bilsky said. According to Sea Run’s website, “salmon blood clots rapidly, and salmon can regenerate their spinal cord.